It used to be that labret studs only came in the normal metal colours – silver, black and gold. But thanks to innovations in piercing jewellery materials you can now get all sorts of colours including these gorgeous pink labret studs. 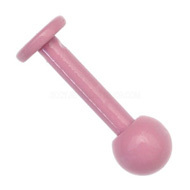 Pink labret studs are made from a great choice of materials and often come with glam pink jewels or cute motifs. 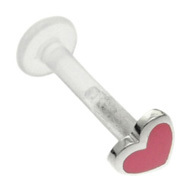 Here at BJS we have a fab range of pink labret studs and lots of other colours too. The most obvious location to wear your pink labret stud in is a labret piercing but they can also be worn on lots of other piercing locations. 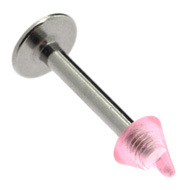 You can also wear a pink labret stud in madonna piercings, medusa piercings, side lip piercings and ear piercings. I often wear labret studs in my ear lobe piercings and you could also wear them in helix and conch piercings. Personally I find labrets more comfortable than some stud earrings, due to the flat backplate. 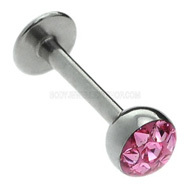 As I said, we have lots of different pink labret studs for sale in the BodyJewelleryShop.com online store. Below are some of the most popular designs and my own recommendations. If your piercings are easily irritated I recommend the two Bioplast labrets. 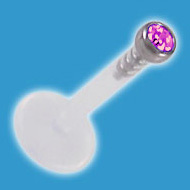 Bioplast is extremely comfortable to wear and can help your piercing heal up after being irritated by something. This entry was posted in Labret Studs and tagged Labret Body Jewellery, Labret Jewellery, Labret Piercing Jewellery, Labret Piercing Stud, Labret Piercing Studs, Labret Stud, Labret Studs, Labrets on January 28, 2011 by Piercing Guru.